One Street, One Family, Three Stories. 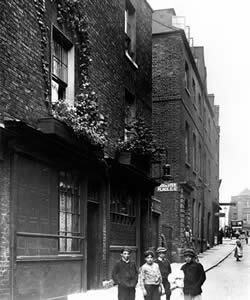 Saffron Hill, written to commemorate the 150th Anniversary of The Mazzini Garibaldi Club and the 150th Anniversary of Giuseppe Garibaldi’s visit to London in 1864, will premiere at The Pleasance Theatre, Islington from 6th-11th October 2015. Click above right for box office. Tricolore wishes to acknowledge the generously sponsorship of The Mazzini Garibaldi Foundation, without which this production would not be possible. Click the image below for details of 2015 commemorative events on the Arandora Star Page. 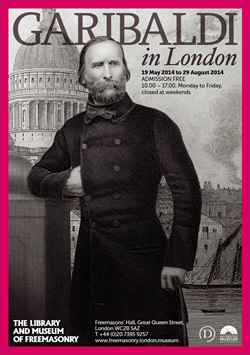 2014 marked the 150th anniversary of Giuseppe Garibaldi's historic visit to London in 1864. 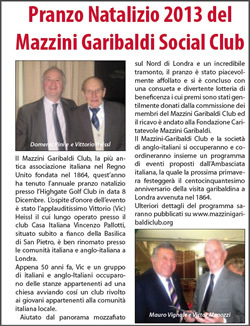 Accordingly, we celebrated not only the visit but also the Mazzini-Garibaldi Club's 150th birthday. Click left for the schedule of events as published in La Notizia . Click right for the programme of events devised by the Core Organising Committee (COC). 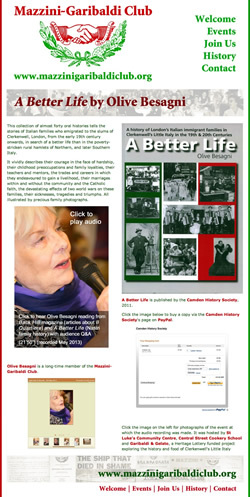 See also the Members' page for events specific to Mazzini-Garibaldi Club members. 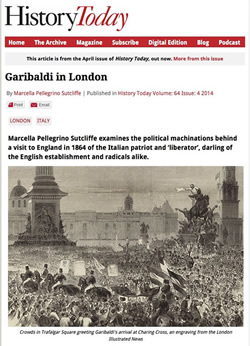 Click right for an article by Marcella Pellegrino Sutcliffe in the current edition of History Today, published to mark the centenary of Giuseppe Garibaldi's visit to London in 1864. The exhibition, at the Library and Museum of Freemasonry, Great Queen Street, WC2, consisted of memorabilia, assembled from all over the UK, of Giuseppe Garibaldi's visit to London in 1864. 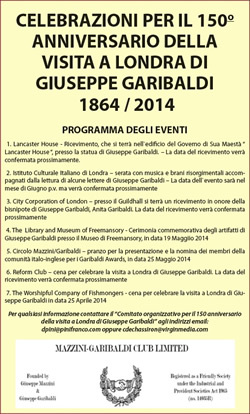 Click the image on the right for a report, in La Notizia, of the celebration of the 150th anniversary at Lancaster House on 1st April 2014. 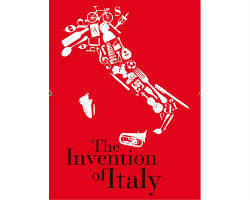 As part of the Italian Cultural Institute's lecture series, The Invention of Italy, Lucy Riall, Professor of Modern European History at Birkbeck College gave a talk entitled Risorgimento 1864: Garibaldi in London. Click left for brief details. The Guest of Honour at the Mazzini-Garibaldi Club's Christmas lunch 2013 was Vic Heissl, who was instrumental in converting church rooms and founding a youth club at Casa Italian San Vincenzo Pallotti, next door to St Peters Italian Church in Clerkenwell, fifty years previously, in 1963. 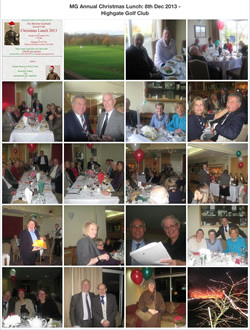 The lunch was held at Highgate Golf Club. Click right for a report in La Notizia. 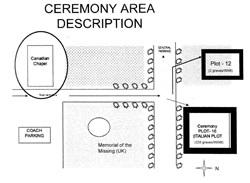 Click left for the schedule of a ceremony at Brookwood Cemetery to commemorate thos who died in WW1 & WW2. 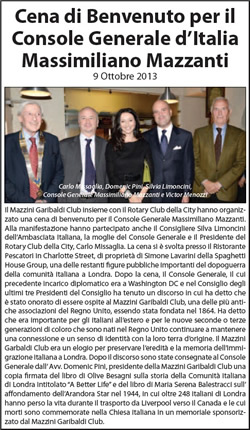 Click right for a report, in La Notizia, of the dinner to welcome the new Italian Consul General, Massimiliano Mazzanti, at Ristorante Pescatori, Charlotte Street, London W1. 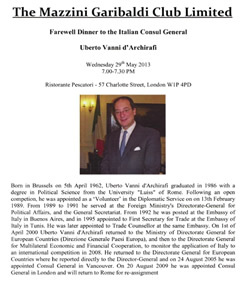 In May 2013, the Club hosted a farewell dinner in honour of the Italian Consul General, Uberto Vanni d'Archifari, at Ristorante Pescatori, Charlotte Street, London W1. Click right for PDF, including brief career details for the Consul General. Click below right for details of a social evening in which Olive Besagni and Elena Salvoni talked about their memories of Little Italy. 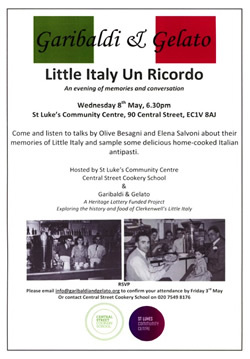 The event was hosted by St Luke's Community Centre, Central Street Cookery School and Garibaldi & Gelato, a Heritage Lottery funded project exploring the history and food of Clerkenwell's Little Italy. Click left for Olive's page, which includes an audio recording of her talk and a gallery of photographs taken at the event. This film by Annalisa Piras takes the viewer on a downward journey of the gradual decline of Italy using the analogy of Dante's descent through the various rings of his famous work Inferno. 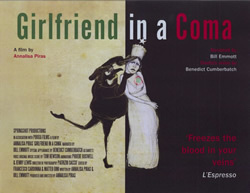 Click the image on the left for a 2-page PDF featuring a poster for the film and a review published in La Notizia, with English translation. 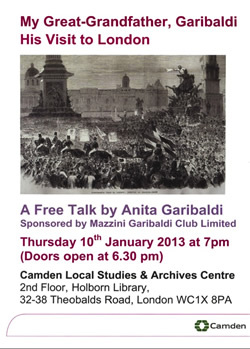 Click the image on the right for a 2-page PDF featuring a poster for, and photograph of Anita Garibaldi's January 2013 talk about her great-grandfather's visit to London in 1864. 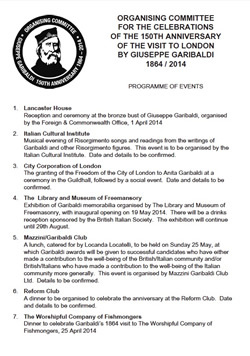 The event was hosted by Camden Local Studies & Archives Centre, which also houses the Mazzini-Garibaldi Club archive. 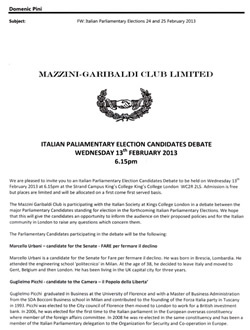 Click the image on the left for a 2-page PDF of details of the Italian Parliamentary Election Candidates' Debate in February 2013, in association with the Italian Society at King's College London. The debate was led by Senate candidates Marcello Urbani and Luigi Bille, and Camera Candidates Guglielmo Picchi and Andrea Biondi. 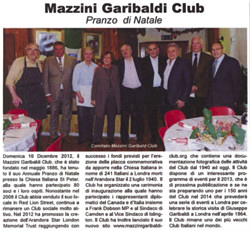 Click the image on the right for an article in La Notizia about the Mazzini-Garibaldi Club's Christmas lunch on 16th December 2012. Click left for details of the dedication of the memorial in St Peter's Church, Clerkenwell on 2nd July 2012, commemorating the 241 London Italians who died in the Arandora Star tragedy. The Mazzini-Garibaldi Club led the appeal for the memorial.